I would like to link to another map in my PRTG dashboard. How can I do this? Moreover, is it also possible to embed a map in another one? 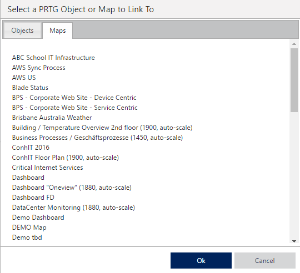 The powerful PRTG Map Designer functionality allows you to easily craft comprehensive maps, which offer different views on your monitoring data. We show you different approaches on displaying and linking multiple maps in one dashboard in this article. Open the Map Designer tab of the map in which you want to embed another map. Drag the Custom HTML Element object into the map. You can find it under Custom HTML, which is the last properties section on the right side of the Map Designer. Add the secondary map's link to the Properties | External Link section of the primary map. The object now contains a link to the secondary map. 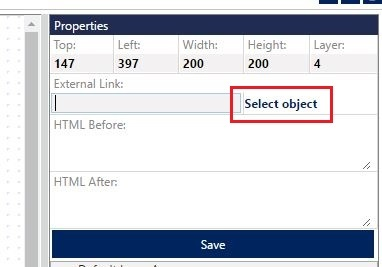 To make the object visible we recommend that you either add a meaningful description to the HTML Before section for the Custom HTML Element, or include an image or object with your own HTML code in HTML Before. Save the changes again and the object, which links to your secondary map, is finished. Nest Maps with "Custom HTML" and "Select Object"
Instead of adding the link to the secondary map, you can click Select object in the properties of Custom HTML Element and choose the desired map. Click Ok and proceed with the steps above regarding the object's visibility. Note: If you use the link option from above, PRTG will open a new browser tab when you click the HTML object in the map. The Select object function will open the map directly in the same tab. Nest Maps with "Custom HTML" and "IFRAME"
Again you need to drag a Custom HTML object in your map. However, this approach requires to access your secondary map first. 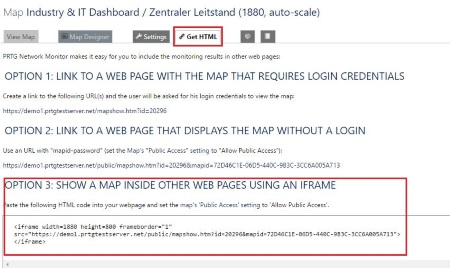 Open the secondary map and open the Get HTML tab. Copy the IFRAME code from Option 3. 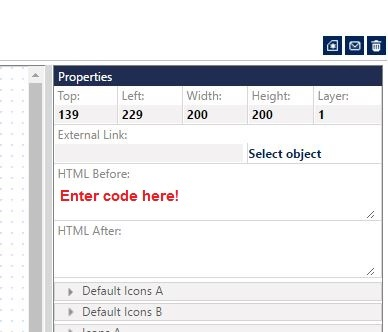 Paste the code into the HTML Before section of your HTML object in your primary map. The HTML object will display the secondary map within the primary map. You can edit the size of the map within the IFRAME code (width and height). If you would like to create complex map structures, you can add multiple HTML objects to your map. It is also possible to link a different map to any object in PRTG if you need a more detailed view of a certain aspect.